I really thought Jenny would enjoy going to CCD like her big sister and brothers. So, I signed her up for the 3 year old program. In the last few months, I have really tried to convince Jenny that she does NOT want to go to CCD, but she absolutely insists she must go. No, she does NOT want to stay home with Daddy and Petey and watch some hunting show with some female hostess – Dad’s bonding time with his third son. No, she really wants to go to CCD. But she doesn’t want to go to her classroom. She wants to go with me. I’m the assistant in Billy’s 1st grade classroom which is right next to her classroom in what is fortunately an open layout. So, she begins the session in her area where they have the children coloring a picture, and when she’s done with that, she comes over and hangs out in our area. No, she doesn’t want to go listen to the stories in her area. No, she doesn’t want to go see what her friend Molly is doing in her area. She wants to stay with me. She will go back for snack, though. Priorities: coloring and snack. Today in CCD, they made these Christmas decorations. The photo was taken last week, since this isn’t the dress she wore today. Side note on the dress: check it out. The latest in 1970s fashion!! My younger sister, Beth, and I had matching ones – this one was worn by first Beth and then by our younger sister, Barb. The one I wore was lost. I loved these dresses. But it is a 1970s fashion. I am not making her wear this dress. I hung it in her closet and she chose to wear it. Honest. Her face tells the true story of CCD – just how much she enjoys going. I really wish she would stay home and watch hunting shows with Dad. Isn’t she pathetic? She looks like a poster child for deprived children in some poor country. Just 30 cents a day – less than a cup of coffee – and this child could be fed, educated and given modern clothing to wear. Please consider a donation. I think I had that dress….way back when. But she will remember the day that picture was taken and tell the tale EVERY Christmas. How do I know? Middle Sister went to Pre-K 3. One day she was perfectly fine when I took her to school and BOOM, popped a fever an hour later. They called and I came to get her. She was sick for a week. 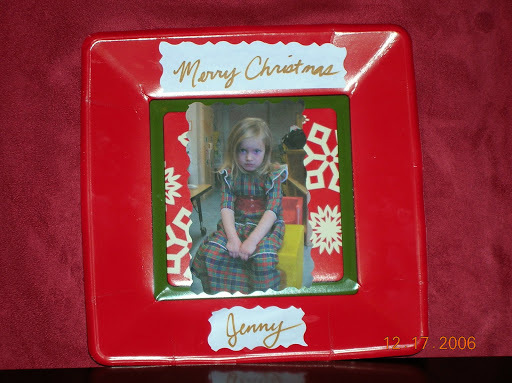 At Christmas she came home with this picture of her looking a lot like that picture of Jenny, made into a Christmas ornament. Way too funny! I love it! Oh dear, bwahahahhahahahaha, I’ve seen that look on my kids!